Michicraft Michicraft T-17 Aluminum Canoe (MichicraftT17) Northern Sport Co.
Michi-Craft 17' Canoe by Meyers are a premier sporting canoe made of heat-treated aluminum. MADE IN THE USA! The Michicraft T Model T-17 Canoe is a livery grade aluminum canoe with 0.050 hull thickness. 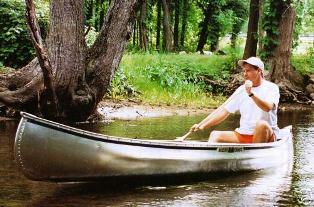 The T series canoe is most often used by rental outfitters, camps, lodges, etc. The T-15 and T-17 have stretch formed sponsons on the sides above the water line. These "safety foils" effectively give the canoe a wider profile for extra stability while keeping the streamlined profile during normal paddling. The inside of T Model Canoes are unpainted. Additional Shipping May Apply to Select Zip Codes. Package includes attached gunwale seating ) Paddles sold separately. Molnar Outdoor, Inc. is an authorized Michi-Craft dealer! Canoe returns must require return authorization from Molnar Outdoor. All Canoes returned must be new, unused, and in its original box. Unauthorized returns will be refused and become responsibility of the returnee. All shipping and handling costs are absolutely non-refundable and all return shipping costs are the responsibility of the returnee and must be prepaid. A 20% re-stocking fee applys on all returns. Note claims for shipping damage must be submitted through the freight carrier and not through Molnar Outdoor. It is highly reccomended that you inspect your canoe for damage before signing the freight carriers release form. Orders cancelled after the canoe has been shipped will be charged for all shipping costs incurred. Returns will not be accepted after 30 days from the date of delivery. Note: All warranty claims must be filed the the individual directly through Meyers Boat Co. in Adrian, MI., not through Molnar Outdoor in Elyria, Oh. Nationwide! Contact us for shipping quote today.